Genever Oppong, BSA minoring in finance, ’18, is a change-maker. It’s why she pursued business education in the first place. Oppong, the daughter of Ghanaian immigrants, grew up in a high-crime area in Newark, New Jersey. She witnessed the challenges of poverty matched with a broken education system—an experience that ultimately informed her passion for business. Oppong realized becoming a business professional could help her invoke change. Through business, she could develop the tools needed to foster a strong community voice. It was a pathway towards meaningful impact. In 2014, Oppong enrolled at Kogod and her journey began. She hit the ground running. Oppong interned at the Trust for the National Mall her freshman year, was a Teen Ambassador Program Mentor for the Smithsonian Museum of African Art her sophomore year, and worked two internships with Goldman Sachs in Jersey City. “There was a lot I wanted to do,” Oppong laughs. In 2016, she pursued another life-altering opportunity—one that’s become a major landmark in her business career. Oppong applied to the Executive Leadership Council’s scholarship program, which offers a generous monetary award, extensive networking opportunities and professional development. She was unsure about her chances to win, but thought she’d give it a shot. Oppong’s doubt quickly dissipated. Not only did she receive an award, but she won first place in her category, Excellence in Business Commentary. 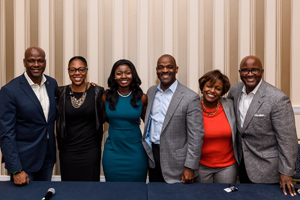 The Executive Leadership Council (ELC), a non-profit membership organization based in Alexandria, VA, aims to build a pipeline of African-American talent in the business world by supporting talented black students. Their scholarship program, open to both undergraduate and graduate students, includes five separate categories, with the Excellence in Business Commentary essay competition as the primary undergraduate award for students attending non-HBCUs. The Honors Symposium is the highlight of the program. Scholarship recipients attend a weeklong convention held in New York City and Maryland meeting leading corporate executives, going on site visits and attending networking events. This year’s Symposium, held the last week of October, left Oppong “in awe of everything. It motivated me to work even harder so I can achieve my aspirations,” she says. Oppong didn’t just attend the symposium, though. She was an active participant in its operation. As a first-place winner, Oppong was invited to moderate a panel discussion featuring top Coca-Cola executives, the company who sponsored her scholarship. Oppong admits it was intimidating, but she tried to approach it as a learning experience: an opportunity to foster an engaging, candid conversation. The most important outcome was added value, says Oppong. She aimed to bridge the gap between what executives (employers) and scholars (employees) wanted in the workplace, crafting her questions to consider both parties’ interests. “An authentic, genuine conversation where you’re really involved in learning about each other was my goal,” she says. For Oppong, the most impactful part of the Symposium wasn’t moderating the panel. It was meeting the executives in attendance—many of whom she considers her heroes. Historically, there have been five notable African American CEOs of US Fortune 500 companies. A majority of the cohort, whom Oppong idolized long before starting her own business career, was at the Symposium. Kenneth Chenault of American Express; Arnold Donald of Carnival; and Kenneth Frazier, of Merck & Co, were all present. “I couldn’t believe I had the chance to meet these incredible people. Before I even joined Kogod, I had them as the screensaver on my computer,” Oppong laughs. The group was part of her inspiration for pursuing business. Their leadership showed the disparity of African-Americans in corporate America—especially black women. Oppong wanted to be part of changing this inequality. “When I realized how few Black leaders there were—and that only one of them, Ursula Burns, was a woman—I made a resolution. I want to become the second African-American female CEO of a fortune 500 company,” Oppong says. Oppong admits she couldn’t be successful today—or realize her future dreams—without her mentors at Kogod. She says the school has supported her academically, professionally, and financially—from mentorship at the KCCD to one-on-ones with professors like Bellows. “Without this community helping me become the best version of myself, I wouldn’t be where I am,” she says. Oppong has many aspirations for the future. She hopes to become a member of the Executive Leadership Council herself. She wants to act as a mentor to other students and co-workers to “help people in any way possible.” And she’s certainly continuing to work towards her ultimate goal of becoming a CEO. Most of all, though, Oppong wants to make a difference. It’s what underlies everything she does—whether she’s leading a panel discussion with Coca-Cola executives, or completing a project for Kogod. She wants to let her own voice shine, while empowering others to share theirs. Learn more about the Executive Leadership Council and their scholarship program.